My husband manages a team of about 6 guys here in North Carolina. Last year, I cooked for them every night. They were in heaven and so happy to come home to a home cooked meal. This year with a newborn thrown in the mix, they will be lucky to get two meals a week. 🙂 I started this year out by cooking the famous sweet and sour chicken. Every single time I make it I am blown away by how amazing it is. It really is better than take out. I also wanted to give them a yummy dessert. I made this frozen mint brownie dessert last year. It is one of my favorite desserts! I decided to switch things up and make it into an oreo dessert. So amazing! 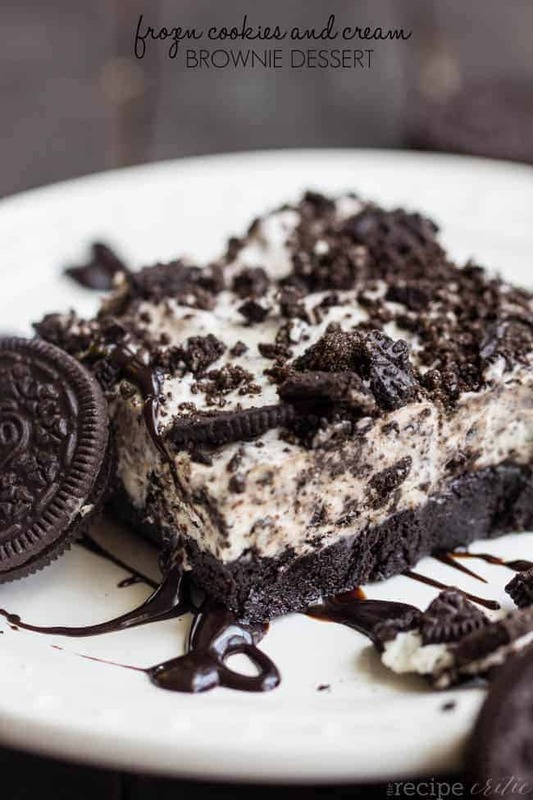 A delicious frozen brownie cookies and cream oreo dessert that everyone will love! Preheat oven to 325 and prepare brownie mix according to directions. Pour into a greased 13×9 inch pan. Bake for 23-27 minutes or until a toothpick inserted in the center comes clean. Let cool completely on a wire rack. Meanwhile in a large mixing bowl, whip the heavy whipping cream until it forms stiff peaks. Combine sweetened condensed milk. Fold in coarsely chopped oreos. Spread on top of cooled brownie and top with reserved chopped oreos. Freeze for 3 hours or overnight. Serve with warmed hot fudge topping drizzled on top and peanuts. That looks awesome girl! Pinning. Have a marvelous week Alyssa! This looks amazing! I am all about any cookies and cream dessert but the fact that this has a brownie on the bottom?! Whoa mama. That looks incredible… Will be making these soon!! Do I fold in the condensed milk into the whipped cream? Or do I continue beating and pour it in? I think I fold it in because I would be afraid of deflating the whipped cream. LOVED the Frozen Cookies and Cream Brownie dessert. It was outstanding! I made it for my daughter’s 15th birthday, and it was a hit. 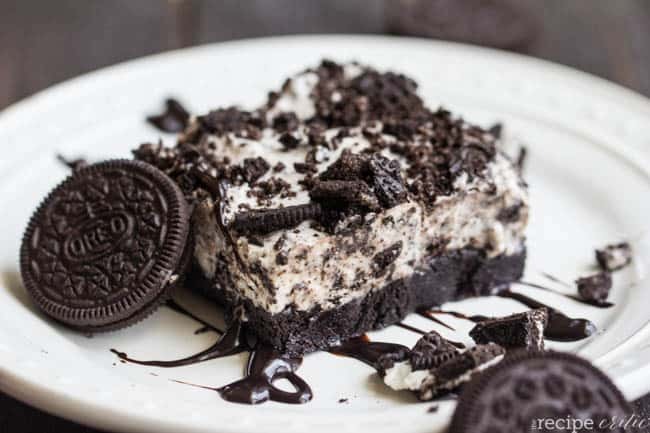 This recipe is far superior to the other frozen Oreo desserts online, as they are mostly vanilla ice cream mixed with crushed Oreo’s. I will make this again. Can I use chocolate or caramel condensed milk?